Long-term memory (LTM) formation requires time because information gradually accumulates across widely spaced learning episodes to a threshold that induces protein synthesis and synaptic changes. However, the neural mechanisms that determine this threshold remain obscure, particularly at the level of circuits. Here, we report that LTM formation from a one-time experience is prevented by induction of new proteins in a specific subset of neurons forming the mushroom body (MB), the learning and memory center in Drosophila. Blocking protein synthesis in early alpha/beta MB neurons after a single training session induced LTM. Learning was accompanied by activation of molecules in early alpha/beta MB neurons and transcription of the serotonin receptor 5-HT1A, which increased the inhibitory constraints on the storage of LTM in the downstream circuits. We propose that learning induces sequential synthesis of new proteins at three distinct locations in the brain to inhibit, enhance, and consolidate LTM. Received Ph.D. (1990) and trained as a postdoctoral fellow (1992) in Rutgers University, Ann-Shyn Chiang joined Department of Life Science, National Tsing Hua University as an associate professor (1992), promoted as professor (1997), took sabbatical to study Drosophila memory at Cold Spring Harbor Laboratory (2001) and became the adjunct International Faculty of Kavli Institute for Brain and Mind (KIBM) at the University of California, San Diego (2011). 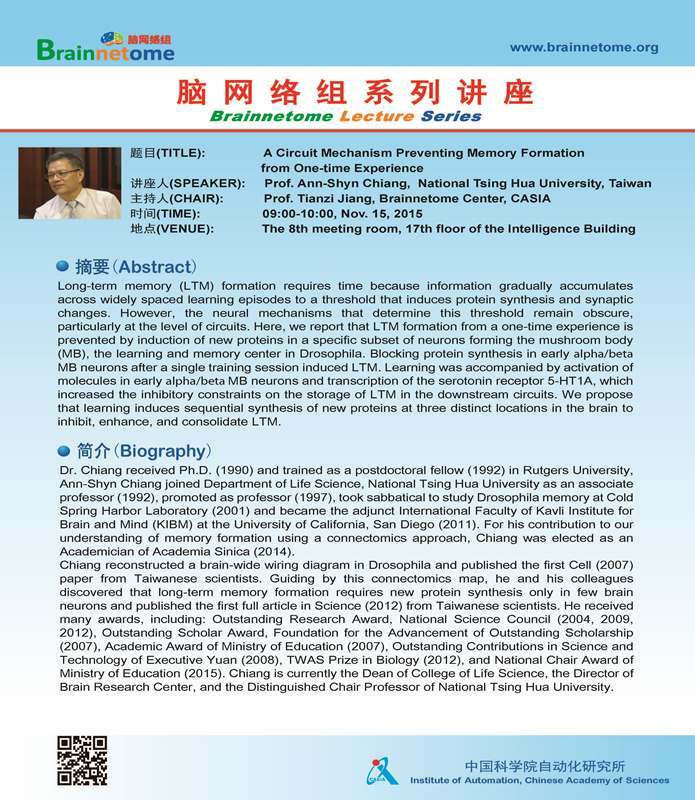 For his contribution to our understanding of memory formation using a connectomics approach, Chiang was elected as an Academician of Academia Sinica (2014). Chiang reconstructed a brain-wide wiring diagram in Drosophila and published the first Cell (2007) paper from Taiwanese scientists. Guiding by this connectomics map, he and his colleagues discovered that long-term memory formation requires new protein synthesis only in few brain neurons and published the first full article in Science (2012) from Taiwanese scientists. He received many awards, including: Outstanding Research Award, National Science Council (2004, 2009, 2012), Outstanding Scholar Award, Foundation for the Advancement of Outstanding Scholarship (2007), Academic Award of Ministry of Education (2007), Outstanding Contributions in Science and Technology of Executive Yuan (2008), TWAS Prize in Biology (2012), and National Chair Award of Ministry of Education (2015). Chiang is currently the Dean of College of Life Science, the Director of Brain Research Center, and the Distinguished Chair Professor of National Tsing Hua University.